Eihei Dogen, the thirteenth-century Zen master who founded the Japanese Soto School of Zen, is renowned as one of the world's most remarkable religious thinkers. As Shakespeare does with English, Dogen utterly transforms the language of Zen, using it in novel and extraordinarily beautiful ways to point to everything important in the religious life. He is known for two major works. 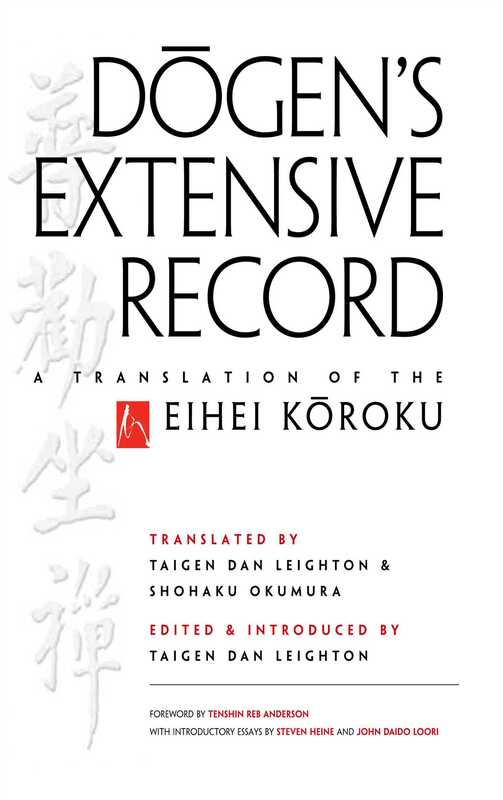 The first work, the massive Shobogenzo (Treasury of the True Dharma Eye), represents his early teachings and exists in myriad English translations; the second work, the Eihei Koroku, is a collection of all his later teachings, including short formal discourses to the monks training at his temple, longer informal talks, and koans with his commentaries, as well as short appreciatory verses on various topics. The Shobogenzo has received enormous attention in Western Zen and Western Zen literature, and with the publication of this watershed volume, the Eihei Koroku will surely rise to commensurate stature. Dogen's Extensive Record is the first-ever complete and scholarly translation of this monumental work into English and this edition is the first time it has been available in paperback. This edition contains extensive and detailed research and annotation by scholars, translators and Zen teachers Taigen Dan Leighton and Shohaku Okumura, as well as forewords by the eighteenth-century poet-monk Ryokan and Tenshin Reb Anderson, former abbot of the San Francisco Zen Center - plus introductory essays from Dogen scholar Steven Heine, and the prominent, late American Zen master John Daido Loori. Eihei Dogen founded the Japanese Soto School of Zen, and is renowned as one of the world's most remarkable religious thinkers. As Shakespeare does with English, Dogen utterly transforms the language of Zen, using it in novel and extraordinarily beautiful ways in his voluminous writings. Born in 1200 to an aristocratic background, he was ordained a monk in the Japanese Tendai School in his early teens, but became dissatisfied with Japanese Buddhism. After traveling in China from 1223 to 1227, he returned to introduce to Japan the Soto lineage and the large body of Chan teaching stories, or koans, which he had thoroughly mastered. From 1233 to 1243 he taught near the cultural capital of Kyoto, then in 1243 moved to the remote northern mountains and founded the temple Eiheiji, still one of the headquarter temples of Soto Zen. There, until his illness and death in 1253, he trained a core group of monks who spread Soto Zen throughout the Japanese countryside. Dogen's writings are noted for their poetic and philosophic depth, though aimed at spiritual practitioners. His two major, massive works are Shobogenzo (True Dharma Eye Treasury) and Eihei Koroku (Dogen's Extensive Record). Although not studied for many centuries aside from Soto scholars, in modern times Dogen's writings, through translation, have become an important part of the spread of Buddhism in the West. "This is a gem of a book that succeeds in conveying the warmth and compassion of one of Buddhism's great towering figures." "Leighton and Okumura have rendered Dogen's dense and idiosyncratic language in clear, lively, and engaging English. This is no small accomplishment. All readers will benefit greatly from this outstanding contribution to the study of Dogen and Zen Buddhism." "This massive work will be a valuable asset not just for students of the Zen teacher Dogen (1200-1253), but for all students of Zen and Buddhism in general. In short, Leighton and Okumura's translation of Dogen's Extensive Record is a valuable contribution to the growing body of Zen literature available in English. It allows Western readers to discover a new side of Dogen, the side he presented to his own students on a daily basis. It will reward careful study." "The many hours of dedicated work [that produced the book] will be much appreciated by all of us now and in the future who value Dogen's inspired writing and talks." "This is a significant time in terms of understanding Dogen in the West, [with] Taigen Dan Leighton and Shohaku Okumura's translation of the Eihei Koroku coming out. People are going to see an entirely different style in this collection of Dogen's later teachings." "This new and hefty volume represents the [previously unseen] other half of Dogen's teaching. We owe a great debt to Taigen Dan Leighton and Shohaku Okumura for this monumental translation, a labor of love and a generous offering to those who choose to wander beyond the beaten path."